Oh, we bet you are. The most recent updates come in the form of a text from Vikings coach Leslie Frazier to Adam Schefter ("Doubtful but sometimes you never know with him") and an ESPN report that both Favre and his teammates now believe his consecutive-starts streak will end tonight. (Kevin Boss says he wants to see Favre play, though not quite for the same reasons Giants fans likely want to see the injured 41-year-old attempt to play.) In any case, both the Giants and Vikings are now in the same city (Detroit) and ready to play a game in front of fans who either had tickets to the originally scheduled game, had tickets to yesterday's Lions-Packers game, picked up free tickets this morning, or bought one of those free tickets from a scalper. Needless to say, this promises to be one of the more unusual football games in recent memory — one that the Giants now know they'll need to win to keep pace with the Eagles in the NFC East. 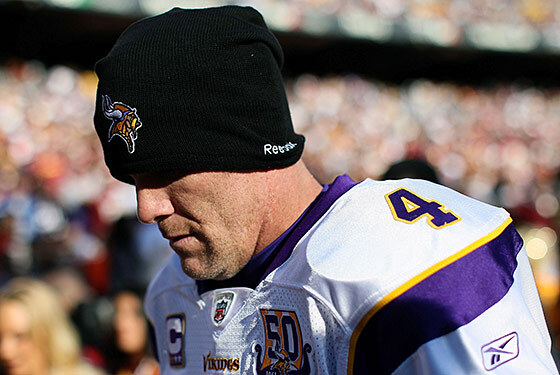 Update: Favre won't play tonight, and his consecutive-starts streak will end at 297.